Susan Westbrook and her painting (Never) Touched Her. There is a tranquility about Susan Westbrook and her painting (Never) Touched Her that can be deceptive. Rather than a peaceful scene of Victorian tranquility, Susan’s painting is about a brutal murder in her family’s past. It led to a trial that shook up the small Ontario town of Fairbank, and left deep imprints for decades to come. “My great-great-great-grandfather murdered his daughter. He banged her on the head with a hammer,” Susan said, pointing to the girl in the painting who is holding her father’s head in her lap. “There was a huge trial, with a lot of publicity, and the newspapers told all the grisly details.” The hammer wounds to the girl’s head were vividly described at the trial and her skull was passed around the courtroom as the murder was discussed. Although he was acquitted, “everybody knew he did it,” said Susan, a third-year Painting and Drawing student from Calgary. The controversy surrounding the murder and the trial was so great that Susan’s family moved out West to escape the controversy. The murder and its aftershocks became a family legend, and that’s what Susan is trying to bring out with her painting, which is part of a series called The Fairbank Tragedy. “It’s a way of explaining the family legend and the truth that survives, as the secrets of your family are passed down,” Susan said. She said she is fascinated by “Victorian mysteries and the doom and gloom” of literature from that period, including the literary work of the Brontë sisters. 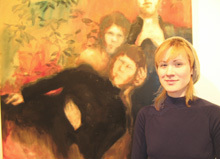 The painting was shown at an exhibition by Concordia’s Painting and Drawing Association at the Belgo building, a key gallery centre in downtown Montreal. Susan has been busy lately with more than just her painting. As co-producer of Art Matters along with Trevor Kiernander, Susan is at the centre of planning for a vast arts festival between March 4 and 18 that has 125 projects taking place at 25 venues at various places at Concordia and around the city. Helping co-ordinate the festival, the largest Fine Arts student event of the year, “has been really rewarding,” Susan said.